High Occupancy Vehicle (HOV) lanes are reserved for buses, and motorcycles during designated time periods. HOV lanes are generally designated via white diamonds on signage and pavement markings. HOV lanes can be separated from other lanes by double white lines, or some form of physical barrier. Presently, there are about 100 HOV facilities nationwide, representing over 1,200 lane miles. There are also HOV lanes in Canada, and in a wide variety of locations abroad. HOV lanes play an integral part in helping metropolitan areas address the needs they have identified for mobility, safety, productivity, environmental stewardship, and quality of life. 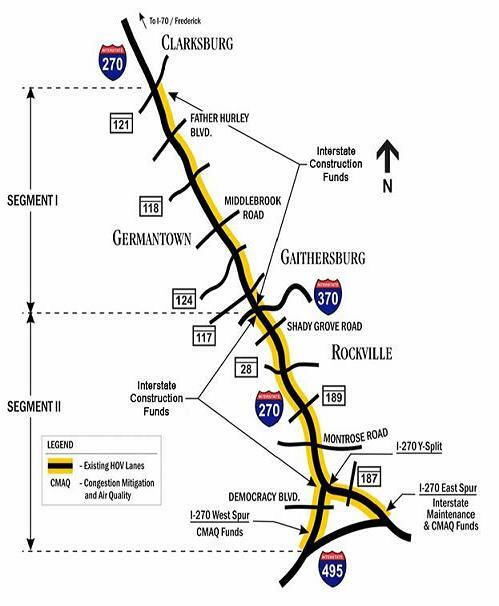 The State of Maryland has two HOV facilities, along I-270 in Montgomery County and along US 50 in Prince George’s County. The HOV lanes are HOV 2+, meaning two or more people must occupy the vehicle. An occupant is any person who occupies one seat in the vehicle (i.e. pregnant mothers count as one occupant, and an infant in an infant seat counts as one occupant). Motorcycles and emergency vehicles (during an emergency) are allowed to use the HOV lanes without being subject to HOV lane occupancy restrictions. Additionally, plug-in electric vehicles (PEV) and plug-in hybrid electric vehicles (PHEV) are also eligible. However, a Maryland vehicle registration and a permit obtained from the Maryland Motor Vehicle Administration (MVA) are required. PEVs and PHEVs registered in Virginia are not permitted to drive solo in Maryland HOV lanes. PEVs, PHEVs, and other hybrid vehicles registered in Maryland are not permitted to drive solo in Virginia HOV/HOT lanes. For motorists with any of these types of vehicles to use Virginia's HOV/HOT lanes, the vehicles must be registered in Virginia and have Virginia clean special fuel license plates. The HOV lanes were designed as concurrent flow, meaning they are not physically separated from the general use lanes. Motorists should not weave in and out of the lanes. The Maryland State Police and local law enforcement handle enforcement of the HOV lanes. HOV lanes were implemented along I-270 because of traffic growth in the corridor. In the early 1980s, SHA widened mainline I-270 and provided a collector-distributor lane system from Montrose Road to I-370. HOV operations along I-270 began in September 1993, with the opening of the HOV lane on the northbound East Spur. The HOV lanes were completed in December 1996. The I-270 southbound HOV lane extends from I-370 to the Capital Beltway (I-495), and is operational during the morning peak period from 6:00a.m. to 9:00a.m. The I-270 northbound HOV lane operates on a 19-mile stretch from the Capital Beltway to MD 121 (Clarksburg Road). The northbound HOV lane is operational during the evening peak period from 3:30p.m. to 6:30p.m. Hours for HOV use are posted on signs along the highway. In the case of I-270, general traffic may use these lanes at all other times. 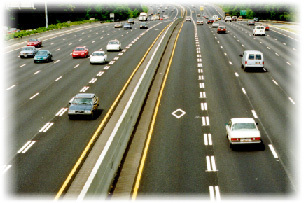 HOV lanes were constructed on a 7.5-mile stretch of US 50 between the Capital Beltway (I-95 / I-495) and US 301 (Crain Highway) in Prince George’s County and opened in October 2002. The US 50 HOV lanes are in operation 24 hours a day, based on safety concerns and engineering judgment. Operating the HOV lane 24 hours a day prevents confusion on the part of motorists unsure whether the lane could be used as a shoulder in an emergency. Twenty-four hour operation simplifies driver understanding, enforcement, and signage. For information about car pools and van pools please contact Commuter Connections, a regional network of transportation organizations coordinated by the Metropolitan Washington Council of Governments. Commuter Connections offers free services to those who work in the Metropolitan Washington area. The organization offers ridematching for carpools and vanpools and administers the Guaranteed Ride Home program.